Financial services in Africa are evolving at a rapid pace. Fintech firms are using innovative technology to provide new services, a number of ‘digital only’ banks are gearing up for launch, while players in other industries (such as telecoms and retailers) are moving heavily into financial services. In fact, telecoms players have been positioning themselves in the mobile-money space for a number of years. A vast array of new payments and banking technologies are emerging. We’re seeing great enthusiasm for the likes of distributed ledger technology and crypto-currencies, and the continued new challenges raised by global giants like Apple, Facebook and Google, all offering payment solutions. For banks to keep up in the face of stiff- ening competition and disruption, they need to smartly integrate new technologies into their offerings – improving levels of convenience, providing exceptional user experiences, and ensuring iron-clad security. To cater for these needs, IDEMIA, a major player in the payments industry, supplying solutions to 1800 financial institutions worldwide, is committed to providing high-tech, end-to-end payment solutions that cover every aspect of the customer lifecycle. “We’re standing on the cusp of a huge revolution in the payments industry,” notes Carole Brits, director of strategic sales at IDEMIA SA. “Physical cards are evolving towards usage ‘beyond’ payment, for example by using biometric cards as proof of life. We’re also seeing almost all local bank cards being issued with contactless capabilities. We think that the convenience of the contactless cards will lead to a significant migration from cash to card payments. IDEMIA has released new innovations such as MOTION CODE, where the CVV number is digitally displayed on the card, and changes on an hourly basis to secure online payments. To increase convenience and security levels even further, F.Code replaces the PIN with a fingerprint reader embedded in the card to ensure that only the valid card owner is able to make transactions. “F.CODE is one example of how we’ve harnessed the power of biometrics to enable seamless payment transactions without compromising security,” says Brits. She explains that the payments landscape will become more diverse in the future, as alternative payment methods rise to the fore – including the likes of tap-to-pay on mobile devices and wearables, bitcoin wallets, virtual/digital cards, in-vehicle payments, and new authentication methods. At the origin of the customer lifecycle, biometrics technology has tremendous application in identifying, onboarding and credit scoring customers. It ensures that banks meet their ‘know your customer’ compliance and legal requirements, and improves operational efficiency within their value chains as well as in the fight against fraud. For smartphone-capable users, the biometric readers and cameras on the phone could even allow customers to self-register for new services or accounts. “In the future, we cannot manage security in the same way that we have done in the past – by making passwords longer or more complex. We need to develop entirely new paradigms for managing the security of data, of identities, and of transactions,” she adds. 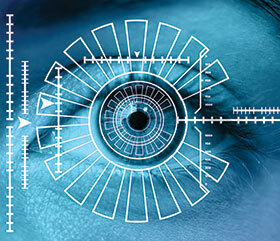 IDEMIA’S focus on ‘augmented identity’ harnesses the strength of fingerprints, facial or iris, to enable highly-secure identity management and high levels of assurance when making transactions.